Staff members have raised over $60,000 for Big Brothers Big Sisters since 2009. 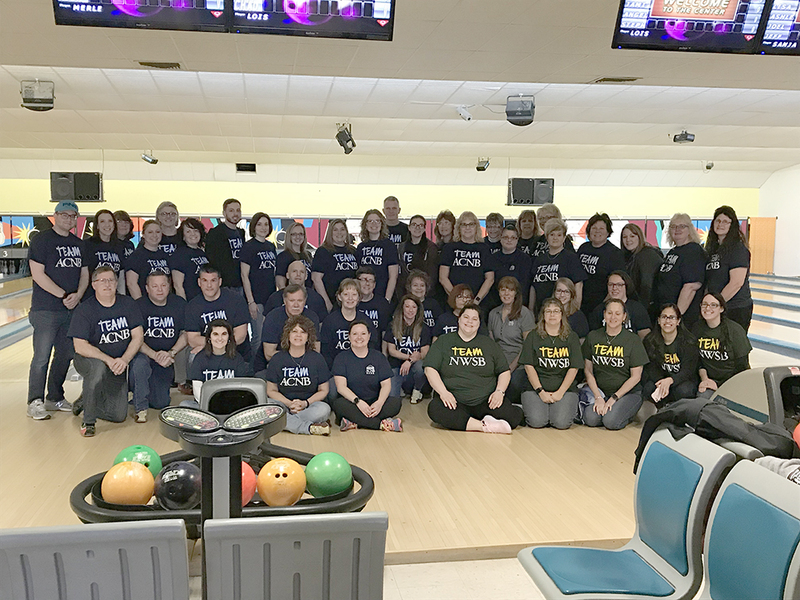 ACNB Bank had two very successful weekends of bowling and fundraising at Bowl for Kids’ Sake 2019 in Hanover on March 24 and in Gettysburg on March 30. Bowl for Kids’ Sake has grown in popularity at the Bank over the past 10 years with many staff members participating every year. 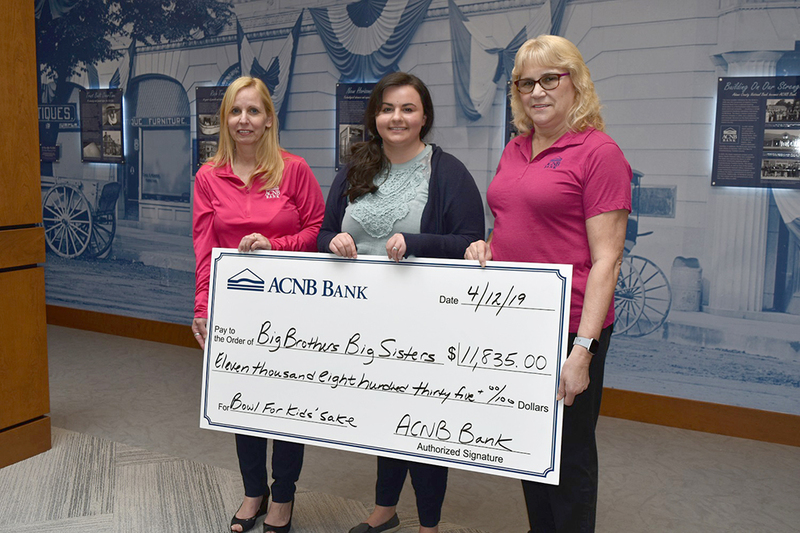 ACNB Bank had 26 teams and raised a total of $11,835 for Big Brothers Big Sisters. The Bank’s staff raised $720 of the grand total by participating in Casual for a Cause on Friday, March 22, and the Bank contributed $1,000 as a sponsor of this event. This year’s total exceeds any other year of fundraising since ACNB Bank began participating in this event in 2009. To date, our grand total over these past ten years is $60,538. This activity benefitted the Bank’s Community Reinvestment (CRA) Program. Staff members working at NWSB Bank, a division of ACNB Bank, also joined in the fun this year. • Document Imaging Representative Mary Kelly with the Alley Oops team raised $1,440 and won an Apple IPad Pro. • Loan Services Specialist Megan Stern with the Gutterly Ridiculous team raised $726 and won a Kobalt 230-piece household tool set with a soft case. • Data Center Administrator Stan Miller with the Tech Strike Force team raised $300 and won a Neora Wellness Products gift certificate. A total of 88 employees raised a minimum of $35. The lucky winner of the PTO Day is North Hanover Community Banking Specialist Ariel Weaver. Ariel raised $50 for Bowl for Kids’ Sake. All teams with 100% fundraising participation were entered into a drawing for an Adams County Winery private tour and tasting for ten people. The winner of this prize is the ACNB Stars and Strikes team including Jamie Shambaugh, Stacey Schuchart, Stephanie Leisenring, Lois Kime and Angela Worley with ACNB Bank Deposit Services. Special thanks to Executive Vice President/Chief Credit & Operations Officer Laurie Laub and Customer Contact Center Manager Cindi Snoke for their assistance with the coordination of this community relations effort for ACNB Bank. Top Photo: ACNB Bank’s team coordinator and the top two fundraisers for Bowl for Kids’ Sake 2019 proudly share the total amount of $11,835 raised for Big Brothers Big Sisters. These staff members include (from left to right): Customer Contact Center Manager Cindi Snoke, Loan Services Specialist Megan Stern and Document Imaging Representative Mary Kelly. 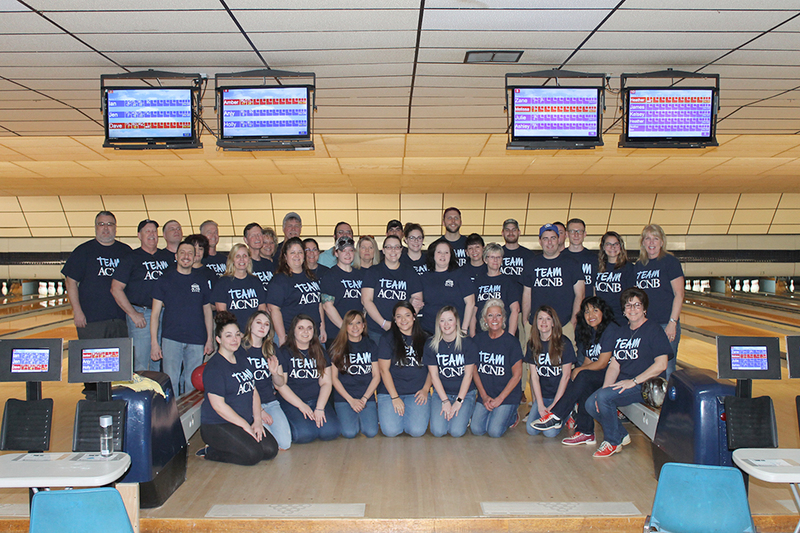 Staff members from ACNB Bank and NWSB Bank participated in Bowl for Kids’ Sake in Hanover, PA, on March 24. TEAM ACNB enjoyed participating in Bowl for Kids’ Sake in Gettysburg on March 30.